Alejandro Mondragon, a team leader for our maintenance division, started working with us in 2005. Over the years, he has worked in both the installation and maintenance departments. His understanding of how the teams interact and how we create beautiful landscapes is second nature. He enjoys his work, overseeing his crew as they provide landscape services for over thirty commercial, residential, and award winning properties. His experience in operating landscape maintenance and construction equipment combined with his knowledge of safety practices, allows Alejandro to teach new members how accomplish their work safely and efficiently. His advanced plant care skills and warm personality make him a great trainer for new crew members, and an ambassador to our clients. Alejandro enjoys expanding his horticultural knowledge around the ever-growing plant palette that he encounters in our clients’ gardens -particularly those that we have designed. Our reputation for incorporating uncommon garden plants attracts clients that want to maintain and enhance the beauty of their landscape plans. Our clients appreciate our commitment to pruning practices that support the health of the plant, promote the plants’ natural beauty and preserve the intention of the garden design. 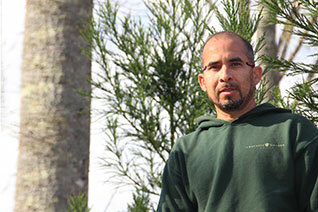 Alejandro lives in Gainesville with his wife and their three children. As a family, they love spending time on lake Lanier or driving to mountain streams, where fishing is a favorite pastime.